O, The Oprah Magazine's Top 10 Favorite Books of 2015. Washington Post Best Science Fiction & Fantasy Books of 2015. "Fascinating... A heart-piercing tale of love, desire and acceptance. Readers will be mesmerized by Dibbell’s staccato prose as much as they are by the harrowing circumstances this mother and child must endure." "Breathtaking. [Dibbell has] delivered a debut novel on par with some of the best speculative fiction of the past 30 years; The Only Ones deserves to be shelved alongside Margaret Atwood's The Handmaid's Tale, Nalo Hopkinson's Brown Girl in the Ring, and P. D. James' The Children of Men. It's that good, and that important, and that heartbreakingly beautiful." "A genre-bending work of punk-rock science fiction." "Densely written but swiftly told, this first novel from rock critic Dibbell starts out as literary dystopia and ends up as a deft study of human identity, desperation, and longing." "A well-known rock critic, Dibbell infuses her debut novel with the stylistic grace of a seasoned writer." "On the other side of Aldous Huxley's brave new world is Carola Dibbell's braver one, all the more unsettling (and maybe even more profound) for being not five hundred years from now but five minutes, in a time at once beyond our control and too immediate to escape. 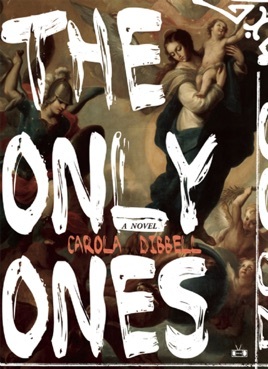 Brilliantly conceived, passionately defiant, deeply felt, The Only Ones introduces  in the form of central character Inez Fardo  one of the most memorable and compelling first-person voices in recent American fiction." "A bracing, tough minded, farsighted novel about bravery and endurance, motherhood and the way life goes on even after the world ends. Every sentence pierces." Carola Dibbell is a highly regarded rock critic whose fiction has appeared in the New Yorker, the Paris Review, Fence, and Black Clock. Writing about books as well as music, Dibbell was a Village Voice contributor for many years. The Only Ones is her debut novel. Dibbell's debut novel chillingly imagines the world in the wake of a global pandemic in the latter part of the 21st century, when much of the population has been wiped out by a potent combination of viruses and bacterial infections that includes tuberculosis, polio, and Ebola. The reader views this apocalyptic abyss through the eyes of Inez Kissena Fardo, a young woman from Queens, N.Y., who has never known a normal existence she has never even seen a baby. Reproductive ability has been annihilated, and fetuses are made in a lab. Instead of parents there are "clients"; mothers have become "hosts," and fathers are now "male product." Inez, who is immune to infection, becomes part of Rauden Sach's team of baby makers for paying customers. When other methods fail, Rauden resorts to cloning her, and complications ensue. The futuristic trials of motherhood are eerily familiar; Inez spends her days rushing from one low-wage job to the next to pay for her daughter's schooling, clothes, and the things she needs to keep up with her friends. The book illuminates present-day paranoias, but it is further elevated by Dibbell's trenchant attention to the corrosive nature of social and economic inequality.